“If you’re not liberal when you are young, you have no heart. But honestly, as I’ve gotten older, I’ve come to realize that this is really a great lie. Basically, Churchill’s line lacks integrity. It’s cute, yes. But what is really does is make me think of youthful idealism as though it were stupidity, and older practicality, as if it were evil, and it allows me to ignore the older idealists, and the selfishness often present in youth. The same is true today of the pervasive idea that you can either “do good” or you can “do well.” The idea simply lacks integrity. Put another way, when doing well and doing good are separated, in a person, an organization or a corporation, the completeness or “whole” does not exist -- there is a lack of integrity. Let’s take a deeper dive into what I mean. Take our U.S. tax policy, for example, that rewards entities for “doing good” with deductions and tax exemptions. Corporate philanthropy (up to 10% of profits), expenditures on research and development, and employee health care, among others, all receive tax deductions as a result of public policy decisions designed to encourage that behavior. where the $ sign represents the highest point on the axis for creating private wealth (i.e., doing well), and the ♥ represents the highest point on axis for creating a social good (i.e., doing good). 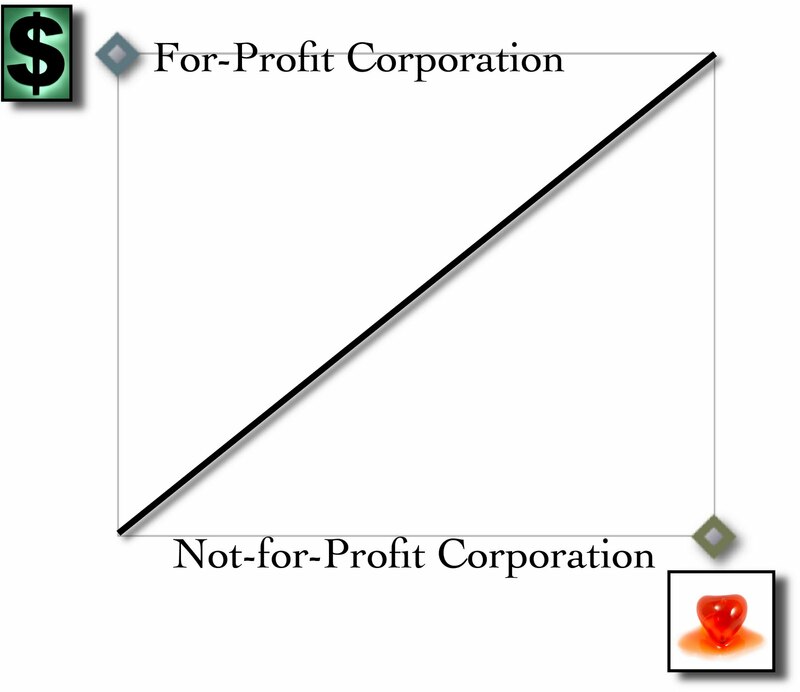 This figure shows that a classic “for-profit” entity (typically a subchapter C corporation or an limited liability company) scores high on the “doing well” axis, but near the bottom of “doing good,” whereas a non-profit or tax exempt corporation scores the opposite (i.e., high on “doing good”, but near the bottom for “doing well”). Of course, that last statement is overly broad. Corporations have long undertaken corporate philanthropy, supporting the arts, education and contributing to programs to alleviate the conditions of poverty. But corporate philanthropy does not represent the universe of ways in which corporations have a positive social impact. Companies employ people, produce efficiencies, improve lives, help avoid poverty and starvation, not to mention creating wealth (not only for executives on the top of a corporation, but also workers holding equity in IRA’s, mutual funds and pension funds). Yet even further than all this, corporate social responsibility programs are entering their third decade of wide-spread adoption, with more and more measurable impact on communities, extreme poverty, and reducing negative stress on the planet and the environment. On the other side, daily press stories profile social entrepreneurs seeking to employ business models on behalf of non-profit corporations. Earned income strategies, corporate efficiency, market analyses have permeated nearly every major non-profit, moving them up the scale of earning more. Non-profit donors are asking tougher and tougher questions about ways to achieve scale, ways to measure impact, and ways to ensure that investments result in leverage. Interestingly, this movement of for-profits toward doing good (in addition to doing well for their shareholders) and the movement of non-profits toward doing well (in addition to doing good) is not being orchestrated. 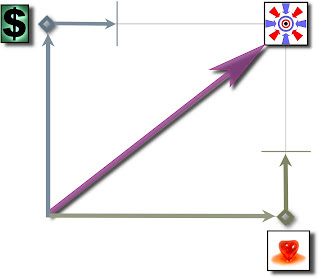 Rather, in some very real sense, the behavior of each organizational type has been, and continues to be, to move towards the fully integrated spot – the spot of integrity, or wholeness and completeness -- in the upper right-hand corner of the earlier diagram. And yet, both forms have their limitations. For example, corporate philanthropy is limited – because tax policy only rewards a deduction for up to 10% of corporate profits donated to philanthropy. But would directors find protection under the rubric of the business judgment rule if they decided to give away 50% of corporate profits? Certainly, at some point, directors find themselves exposed to arguments of wasting corporate assets. Thus, the law has a barrier on how much good a typical for-profit corporation can undertake, at least in terms of giving away profit. So too, most states limit special purposes that corporations may undertake, if it creates a trade-off to the primacy of maximizing returns for shareholders. Likewise, capitalistic strategies of earned income strategies have their limits for non-profits. The typical organization qualified under Section 501 of the Internal Revenue Code, may earn profit to support charitable activities (even income unrelated to their charitable mission), so long as they pay taxes on the income. But at some point, the earned-income strategies of a non-profit threaten a test of “substantial relatedness” to their charitable mission, so that too much earned income could jeopardize its charitable status. And yet, one look at the diagrams above, begs the question: “Why not create an entity unfettered by the “for profit” and “non-profit” rules, thereby establishing corporations for broader benefits (or what I like to refer to as “for-benefit corporations”)?1 Permitting a form that allows the entrepreneur to build an organization that aims directly for the “for-benefit” sector represents the shortest distance between two points, right? 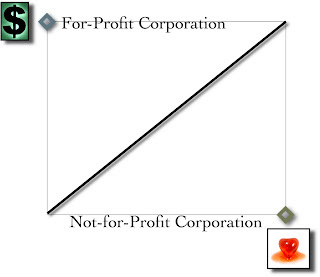 I mean, can you think of anyone with more than a fifth grade education who would look at the diagram above and, seeking to build an entity in the “for-benefit” sector, would chose to first build a typical for-profit or non-profit corporation, and then move towards the “for-benefit sector?” Of course not! Yet, the tax code, state statutes for incorporating, case law surrounding the dictates of fiduciary duty, and other forces dictate binary thinking when evaluating the proper type of entity for accomplishing objectives – if you want to do well (i.e., create wealth), then you form a for-profit corporation, and if you want to do good (i.e., create a social benefit), then you form a non-profit. In each case, the result is something less than perfect, particularly for the social entrepreneur who is determined to create a different type of corporation – one that can both do well and do good at the same time. Until recently, available corporate forms left entrepreneurs with a simple “either – or” equation. You either adopt a corporate form that maximizes the possibility of doing well, or adopt a corporate form that maximizes doing good. This has been the great legacy of our public policy decisions. Personally, I find such a binary choice unhealthy, both at the local and at a global level. When I meet with private investors about investing in Pura Vida they focus on one of two things – the ROI of their investment dollars OR the social impact and leverage of their charitable donation. They seek either to invest $1 million, or donate $10,000. When I offer that their money will do both and begin explaining Pura Vida’s model, they respond by saying simply ‘you’re making my head hurt,’ and move on to the next item on their desk. When investors think in this manner, entrepreneurs are left with only two types of cars to build – one that has a very small tank for gas where they are the driver and have control over the destination, and one with a very large tank for gas that could even become self-filling, where they may drive for a time, but where ultimately, the “professionals” will take over and drive for scale. This typifies the social entrepreneur’s dilemma – accept an investment of $1 million or a donation of $10,000. Scale quickly, with the ability to cover long distances, but risk that others – the professionals – may take over and redirect the mission in favor of profit solely or primarily. Or, make the scale and the speed secondary goals to consistency of the mission. Other issues immediately follow. Compensation, for example, tends to vary widely between the two types of corporations as a result of the available financial resources. “For profits” have the advantage of the million gallon tank for gas, meaning that paying for the best and brightest is not only feasible, but expected. By contrast, with the significantly smaller tank of gas, the executive director of the philanthropy is practically expected to accept lower pay. After all, their corporation is doing good. Why should they make good money too? Too often, this satirical idea turns into the tyranny of doing good. Many times I’ve heard the head of a philanthropy or social venture explain that their labor costs are simply lower because they don’t have to pay as much for people to come and work for them, because they are doing good. But there are implications far beyond the individual corporation and its employees. Globally, the U.S. people are known around the world for two primary and remarkable assets – assets that the rest of the world seeks to replicate. First, the entrepreneurial spirit of Americans is widely respected and held in awe, both here and abroad. Second, the heart of Americans for helping the poor, the disadvantaged, the hungry, and those in distress (whether through natural disaster or conflict) is unparalleled. So what’s the problem, you may ask? Well, the two assets don’t work together on an integrated basis, or to borrow Jed Emerson’s concept, they don’t work to achieve an optimized blended value. We export our entrepreneurial spirit through our corporate form, emphasizing the idea that making money is the greatest good of a company, all the time creating devastating results in the harvesting of natural resources, minerals, cheap labor, and regularly selling goods that people in the developing world don’t need, or worse yet, that cause physical harm. All this is done in the name of capitalism. Then, when disaster strikes, the biggest and best non-governmental organizations (many of which are U.S.-based, founded or funded) with great corporate donations (from some small percentage of profits) go to work spreading the goodwill of the American people. We don’t see the need for integration of our “doing well” with our “doing good,” but can we blame the world outside for their cynicism? With one had we take and with the other hand we give. What the rest of the world sees is hypocrisy. What I see is a lack of integrity – the state of being whole, entire, or undiminished; a sound, unimpaired or perfect condition. I’m not talking about morality. I’m talking about working to create a “complete” form of doing business. Doing good and doing well through the same organization should be the aspirational goal of every entrepreneur, every investor, every philanthropist and even the government. In many respects, our national security and our future may depend upon it. But even if that’s too idealistic to hope for, why wouldn’t that form exist for those who want to pursue the “for-benefit” model? 1 The term “for-benefit corporation” is used throughout to describe the type of entity distinct from the typical “for-profit” and “non-profit” models of a corporation. These are entities are built to optimize private wealth innurement (doing well) and social benefit (doing good). “For-Benefit Corporation” is a trademarked term of the Fourth Sector Network, which ascribes a different meaning. According to a recent McKinsey global survey, many executives doubt that their corporate philanthropy programs fully meet their social goals or stakeholders’ expectations. But an effective philanthropy program can deliver far more than simply enhancing your company’s reputation. Top business leaders share their insights about proven, key strategies for ensuring an effective and sustainable corporate philanthropy program. I definitely agree with the statement of the current problem. Why not just change the restrictions on the existing corporate form and empower more direct shareholder action? Does the third form open new avenues of asset wasting? 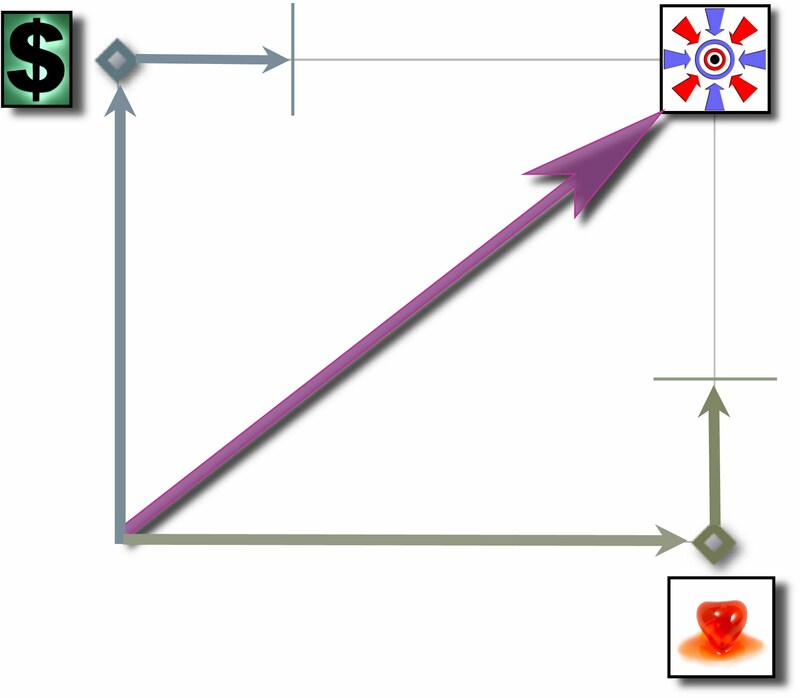 The solution of a third form may limit impact. Changing restrictions would apply to all, not just those that chose to change form. And, there are often unforeseen consequences. In this case, the door opens to deceptive sophistry and uncertain IRS and other forms of regulatory (SEC) treatment. AES had to disclose its commitment to values as a Risk Factor in its S-1. Hats of to you!! Wonderful job with the post and the quote at the start of the post is just mind blowing! best binary trading brokers usa is very easy; too many traders, especially profession or seasoned traders try to over complicate the trade. Commonly I've heard the leader of an altruism or social endeavor clarify that their work expenses are basically lower in light of the fact that they don't need to pay as much for individuals to come and work for them, in light of the fact that they are doing great. This is a very interesting post. I have found quite a lot of information out about trading on this site. Thank you so much! It is an incredible web site. We need these kind of posts and thanks fro share such a great as well informative post thanks a lot. I read all the article very informative and Thanks for sharing. When you are in a bind and seeking professional essay writing services, there are some places you should cross off your list first that may help you out. We have provided best plus affordable software development services to numerous large as well as medium entrepreneurs. We are the masters in offering effective social media marketing agency.